Angelastic wrote: ...I was quite surprised to find that a chicken & chips (or maybe turkey leg and chips) stall at a theme park I went to in the US was actually selling chicken turkeydinosaur and chippies. Who eats dinosaur with chippies? Dinosaur and chips is just like fish and chips; it entails hot chips. This calls to mind a shirt that my son has. It's produced by the author of the Questionable Content OtherOtherComic. I like that OtherOther Comic, it is quite funny. Ah, I've been waiting for the SAEWITRBASA. I was working at a place which had a normous computer room (mainframes) with a big red button. One day someone pushed the button. All the computers powered down. They rushed around switching everything back on and someone asked the guy what happened, he demonstrated that he didn't do it on purpose, he just touched the button like thi... and click, everything switched off again. More rushing around getting it back online. The manager came in with steam coming out of his ears 'what were you doing?' 'I wasn't doing anything, I just put my arm out and ...' click, a third time. Our hero was sent home. So Cueball was intentionally tasting it earlier? OK, that seals it. No taking culinary tips from Cueball. I love the blitzers blindposting from the past. But it works be if we all agree to disagree. Kieryn wrote: NewData available up to roughly 3 hours ago. Also added direct links to pages of the Book of Time from the navigator. Now you all have no excuses for writing lots of fun stuff in there. "links to the outside" is now including links to the inside... is this deliberate? Kind of deliberate... I loosened the criteria because I was excluding some things that people thought ought to be included. Could you let me know which links I'm including that you think I should not be and I will refine further. 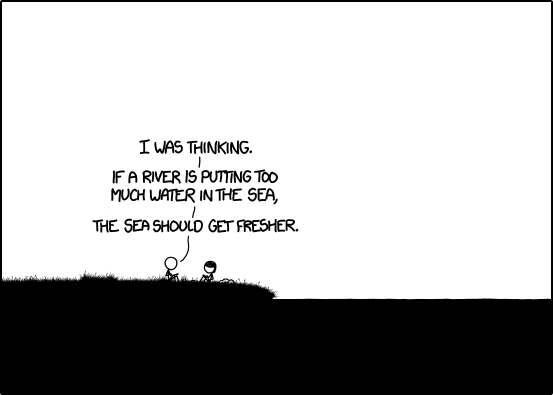 I would say that anything on xkcd.com be considered internal (including fora., forums., www. and blog.). 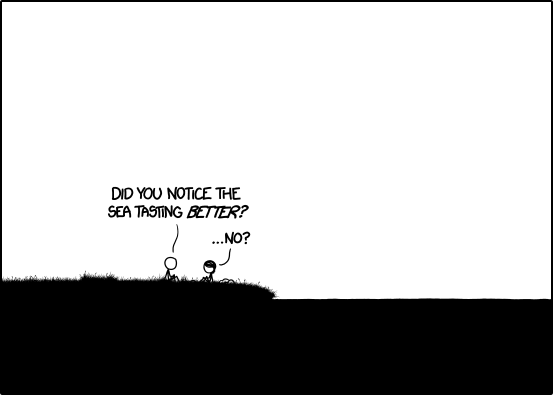 Perhaps any URL which matches the regex |https?://[^/]+xkcd.com/. *| is internal and all else is external. Dutch is easier than you think, you just read it out loud. (Well that works for frisdank=fizzydrink and zak=sack, not so much for kraan.) Practical test: what do you think "doe-het-zelf" means? On their own? Cobs (if riverish) or baps (if seaish). Does this make sense if read backwards? likewise! been reading that one daily for about 7 years. couldn't imagine the ketchup on something like that. He means way back in frames 175 and 487, I assume? Funny. I was going through it thinking "oh yes, it does"
I found this one last month, Girl Genius, it is taking forever to get through but it is a good one. This thread has over 26,000 posts in it. That makes me about 99.82% lurker. Even the most prolific correspondents are around 98% lurker. We're all mostly lurkers here. So, fellow lurkers, please post! Where I worked, the BRS was protected by a Molly guard (a removable plexiglass guard). Apparently the term "Molly guard" comes from an incident with a young girl named Molly who loved to press the big button. Thanks for bringing that up again, I was looking for that because we needed something Time-related to add to (Link is very NSFW) http://rule34.paheal.net/post/list/xkcd/1. I think this story contains a good reason: http://blogs.msdn.com/b/oldnewthing/archive/2008/05/13/8497704.aspx. Then I'm wrONG, yeah I'm wrONG, this ain't a love sONG. With thanks to bONG jovi. Edit: That's how I remembered it; Megan tasted the sea by accident, Cueball on purpose. Edit2: Cueball tasted the sea on purpose, not Megan tasted Cueball. Last edited by Smithers on Sat May 18, 2013 12:02 am UTC, edited 2 times in total. Megan, always the sensible one. Smithers wrote: Edit: That's how I remembered it; Megan tasted the sea by accident, Cueball on purpose. yappobiscuits, FTW! Invisible FTW to Smithers! @Valarya - I can image you (a southerner) saying that, but maybe as "five thick slabs of blue cheese, yeehaw!" .... is that wrong? lol. Mine would be "five, like, thick slabs of blue, you know, cheese". @lmjb1964 - Nice rendition. Maybe that's what we should post as a response if the topic resumes. Angelastic wrote: Who eats dinosaur with chippies? Dinosaur and chips is just like fish and chips; it entails hot chips. Everything goes with potato/tortilla chips. Fries are fine with it too. I'll eat anything with anything, actually. BlitzGirl wrote: Wow, the panorama is awfulesome, azule! You're right, that flat bit does look odd compared to the other terrain. *phew* I take it that it works. I could upload it, but I couldn't download it to see if it was successful. Thanks for the feedback. Ontopix: I saw the discussion back in the xip, but had nothing worthwhile to add. But I bode my time, and look at me now! woot! heh. Now how about an movie? People talking, not with, but in footnotes is going to take some getting used to! Cool gif job. I actually do that a lot while editing the file. lol.
! Again, not a footnote. Last edited by azule on Sat May 18, 2013 2:02 am UTC, edited 1 time in total. Reading through that feels like reading through the OTT while in severe coma deprivation. Does this dialogue not confirm that the sea is in fact made of water? I did think Cueball was referring to the body of water next to them as the sea, since they just drank from it... I don't know why he thought to bring it up now if he was talking about back at home. Ah The Madness. I remember that amusing period of the OTT. It's amazing how this thread has evolved to the point where I'm pretty sure are totally resistant to any of those type of filtering tricks. We adapt like a well oiled immune system. 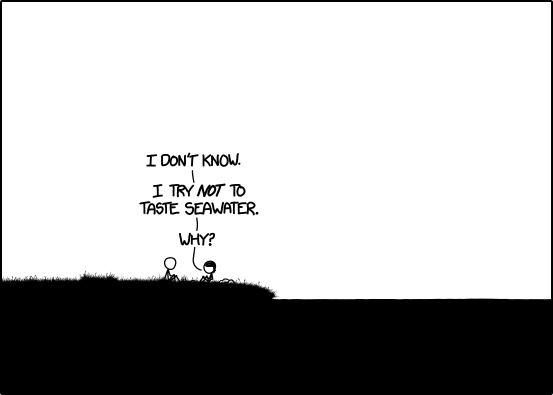 I'm wondering what the sea is supposed to be tasting better than. ucim wrote: I'm wondering what the sea is supposed to be tasting better than. I think it's implied that it's "better than before." Like you would say "I'm getting better," well better than what? Better than when you were sick or whatever. Also, cue discussion of pollution. Maybe they're not as clueless as we thought. If the sea was receiving a large input of freshwater, then it would taste less and less salty as the areas near the coast were inundated with the less-dense freshwater. When Cueball tasted the sea in the sandcastle era, he remarked "I've had worse." I think he meant that literally (that the sea had tasted worse before), that he's remembering that thought now, and that he's sharing his observation with Megan. Well, he said that he had had worse. So some time even longer ago he had sea water, which was even worse than it was this time. And now he's thinking that the river is making it taste less bad. I took it to mean 'better than the river2'. Although it's weird that he didn't say so, which might mean that he does mean 'better than before'. But then again, he hasn't tasted the sea2 in a while (only the river2, and they haven't referred to the river2 as the sea1 before). Eh, I guess we have to wait for it and see1. Me: Better every day, but still not well? Doctor: That's what I wanted to hear. Pollution. All of this discussion has assumed that the river is fresh and potable. I've had stream water that tasted horrible, and sea water that would have been great except it was salty. Cueball? Thinking? That can't be right. Unless...the brain-eating amoeba is actually changing his brain for the better? BlitzGirl wrote: Cueball? Thinking? That can't be right. He's a real thinker! All this time we've taken him for a dunce and it turns out he's simply been thinking at a higher level than us, so we didn't understand. Cueball for class president! Thanks for sharing. Welcome to Earth! So, when I read mscha's quote, my first thought (not entirely unreasonable, given OTT history), was that it was encrypted, or Klingon, or...but now I find out that it is Dutch, and I am an idiot. Sorry for insinuating you were not from Earth. I'll just slink out of the room now and hope no one notices. And me! Although not for that long, more like 3 years. I have actually read it all through twice (once when I first discovered it, and again maybe a year later). 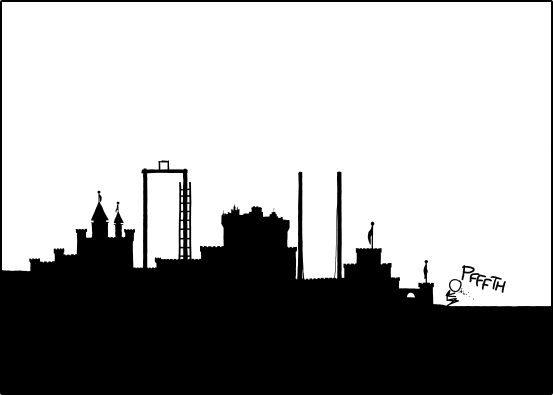 It's quite enjoyable to do a full read-through of, since unlike say xkcd, it's one continuous story. Doing a full read-through actually helps make the story much clearer in your head than by just getting one comic per day. So it may be a long ketchup, but an enjoyable one!